More than 400 pro-lifers participated in the annual Speak Out Illinois conference, held each year around the anniversary of the U.S. Supreme Court’s infamous 1973 Roe v. Wade decision that legalized abortion. The meeting memorializes the 41 million unborn babies that have been legally aborted since 1973. This year’s conference, co-sponsored by thirty-one national, statewide and local groups, including the American TFP, featured Francis Cardinal George, Miss America Erica Harold, veteran pro-lifer Joe Scheidler, who with his wife Ann was awarded the Henry Hyde Life Leadership Award, and Congressman Henry Hyde. The conference theme was “Understanding ‘Choice'” and workshops were held on such topics as “How the Christian Family Handles a Crisis Pregnancy;” “Breaking the Silence, Opening the Dialogue,” which dealt with learning how to respond to someone who has had an abortion; “Inside the Abortion Clinics” by Anthony Levatino, M.D., who told the inside story from a former abortion provider’s perspective; “After the Choice” which dealt with what happens after the “choice” and the truth about abortion and its consequences; as well as a workshop on how to instill the virtue of chastity and respect for life in children. The day-long conference ended with a candlelit Memorial for the Unborn where mothers, sisters, brothers, grandfathers and others offered heart wrenching reflections on the loss they felt suffering from abortion and its effects. 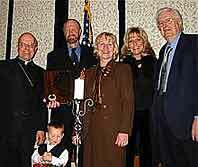 This entry was posted in In Defense of the Unborn and tagged 2004, abortion, After the Choice, American Society for the Defense of Tradition, Anthony Levatino, Congressman Henry Hyde, Erica Harold, Family and Property, Francis Cardinal George, Henry Hyde Life Leadership Award, Joe Scheidler, M.D., Reign of Mary, Roe v. Wade, Speak Our Illinois, TFP, U.S. Supreme Court by TFP.org. Bookmark the permalink.